Dishwashers are a great time-saver.... After a good meal everybody wants to relax, and nobody wants to wash the dishes. So, when your dishwasher isn't working properly, somebody has to wash the dishes by hand. Instead of suffering from “dishpan hands,” it's better to rely on the expert technicians here at Arizona Appliance Repair. If you call us during business hours, we can fix the problem today. Still, before calling us, first try these easy troubleshooting steps: If your dishwasher isn't working at all, check to make sure that the circuit breaker isn't tripped, or the fuse isn't blown. If the dishwasher is receiving power but there's no water, make sure that the water shut-off valve (generally under the sink) is open. If the water shut-off valve is open but the dishwasher still isn't receiving water, there may be problems with other valves inside the unit. Or, the spray arms or other internal tubes may be clogged. In any case, you should call us for expert help. Sometimes, door switches, selector switches and timers malfunction. In any such situation, you should call AZ Appliance Repair and we'll send one of our expert technicians to find and fix the problem. If water isn't draining from your dishwasher, especially if you have a garbage disposal under your sink, or that disposal was recently installed, then the drain outlet may be blocked or capped. Finally, if your dishwasher is working, but it's not cleaning well enough, try adding more soap, or adding soap to both parts of the soap cup. Other common issues involving dishwashers include torn or slipped drive belts, faulty motors, and broken pumps. All these problems are best left to the skilled professionals here at Arizona Appliance Repair. 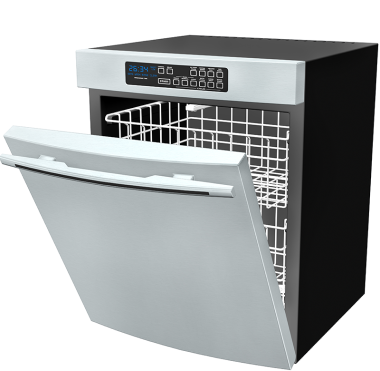 Our technicians have the tools, training, and replacement parts to handle any sort of dishwasher repairs. Of course, we guarantee our work and all replacement parts carry a full factory guarantee. Best of all, if you call us during normal business hours we'll come to your home or business anywhere in Tucson and repair your dishwasher the same day. If an appliance stops working, call us at the Repair Center phone number closest to your home, and we'll respond quickly. In most cases, we can repair your appliance on the same day that you call us.